Threat: What are We Dealing With? 1. What is the primary basis for any given groups existence/function? 2. What violent actions or patterns of actions has each individual group been known to conduct? 3. What type of offensive capabilities do we know/assume the threat has? 4. What is the probability that we’ll eventually have to deal with “X” group? 5. What is our tribes visibility and impression to the threat? Those are four simple questions that are going to have some complex analysis applied to them. I’m not going way into the weeds with this one but my goal here is to get you to think in an analytical manner when looking at your threat. 1. Survival of the organization. 2. Security of the members and its “turf” or operational area. 4. Sense of belonging and self-esteem through power. For some further reading on why gangs (and other types of this organization exist) there’s an excellent online book by Mike Carlie Ph.D titled “Into the Abyss“. Although it’s focus is on street gangs much of the psychology can be readily transferred to other types of organizations as well. When looking for patterns of violence or violent actions one doesn’t have to dig too far. A quick Google of “Loz Zetas Violence” or “MS13 tactics” yields more results than you can care for. What we want to do here is identify what type of tactics certain groups within our AO normally employ. Things like drive by shootings, or kidnappings, firebombings, or using IEDs. Something you’ll notice is as the threat becomes more sophisticated in its capabilities it’s tactics also follow suit. A run of the mill violent street gang may not employ fire and maneuver however a group of cartel Narcos Soldados most surely will. It’s interesting to note that even as a threat becomes more sophisticated and develops a sound tactical operational art they may not necessarily drop lower tech tactics. Those same narco cartels still conduct drive by shootings. A good technique to flesh this kind of info out is to do some good old fashioned research and “Waffle House” intel gathering. Pay particular attention to events like carjackings, drive by shootings, home invasions, arsons, increases in random sporadic violence (especially directed against authorities), large drug busts – including meth labs, etc. Now comes the fun part – determining the threats offensive capabilities. Right up front don’t assume any type of threat is going to be lacking in firepower. If I can Google lightning link and order an FA bolt carrier then so can any other dirtbag on the net. Those same .pdf files everyone downloads are also widely available to the threat forces as well. See that pic up top? Well those ain’t water balloons. You need to assume that the threat has the capability to employ serious firepower including automatic weapons, explosives, and possibly even ad hoc armored vehicles. Ehh? Naw surely they won’t employ bombs. Yup – there’s been a couple of instances just this year of IEDs being found in busts and even attempted IED attacks against cops and rival gangs in Oklahoma, California, and Georgia. There’s a simple truth here – all four of the types of violent organizations I outlined in the last entry have increased their lethality exponentially over the last five to ten years. Gang members are well documented in the military. 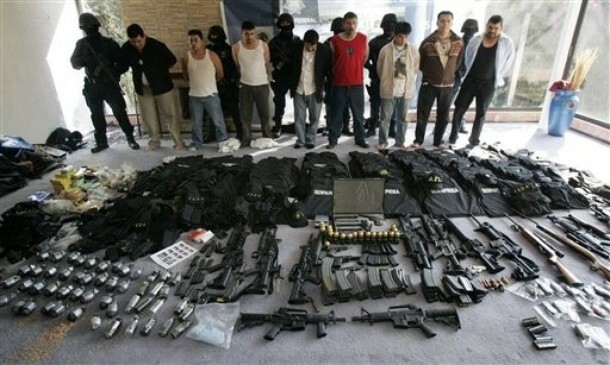 Hamas has a known presence in Mexico cooperating with the Narco-cartels. Take a gander at this flyer that describes methods criminal organizations use that enhance their readiness through different type of training. So this is probably an easy one – assume any ground based capability can and will be employed by all violent organizations. For the time being it’s pretty safe to assume that only the more sophisticated and resourced violent elements can afford and field things like air support. That’s going to change in the near future as RC and drone technology proliferate and drive costs down. More on drones later down the road. So what is the probability we’ll run into “X” organization? This bleeds over a bit into the “Where” area but IMHO it’s directly attributable to three things: Proximity, Visibility, and Appearance/Impression. Logically the closer you are to any given threat the more likely you are to encounter it. If your nearest town is contested between two or more violent organizations then it’s more likely you’ll encounter the one nearest you – it’s human nature to take the path of least resistance and rather than cross through and raid or attack a location those elements will most likely work outwards from their location. You visibility and impression play into the probability of an encounter as well. Common sense dictates if your tribe is highly visible and gives the impression that your little rural community is doing extremely well after the SHTF you’ll be a much more likely target. Especially if you seem like a soft target (one that is barely defended or disorganized). This is where OPSEC is critical and you need the understanding among all of the Tribe members that information in any way shape or form about your tribe shouldn’t be discussed outside of the tribe and it’s members at all. The slightest slip could put you on the radar – think about what would happen if a starving band of heavily armed gangbangers finds out you’re fat dumb and happy when the urban jungle isn’t giving them what they need? Bad juju there. You’re going to notice I keep going back to OPSEC in the blog. It’s that damn important and IMHO it just can’t be stressed enough. People like to talk and it’s going to be a challenge to get them to curb that instinct. Do your homework, do your legwork, but whatever you do don’t assume that you’ll never have to deal with threats like these. Society has fostered a false sense of security among folks that “Oh that’ll never happen to me” and I’ve heard that over and over again in a lot of reports from victims of organized violent groups. The BJA National Gang Centers Publications page has a ton of pubs to dig through. The Borderland Beat is an excellent site that gives you a lot of info on the drug trade fueled violence along the border including profiles of the cartels. The Spanish language site Blog Del Narco is what I consider to be one of the best sources of info. Google Translate is your friend. The Anti-Defamation League (ADL) has a lot of really generic info on racially radial groups in the US. Not a big fan of them because they fail to cite any of the radical Jewish groups in the US (yes they exist) but once again, your tax dollars are helping to fund them so you might as well get some use out of it. 3 Responses to Threat: What are We Dealing With? The above took place in Nuevo Laredo back in 2010. These people have been using platoon/company size infantry tactics successfully for several years. Once they learn the staff work necessary for battalion and larger size tactics (there is evidence that they have it in Mexico and Brazil), Katie bar the door. It also must be assumed that they have the skills necessary successful battlefield tactical coms at this level, something most of us don’t because we don’t have the money/skill. Jimmy – spot on. In fact the cartels have acquired mil grade crypto comms (a lot of it from the Mexican army).